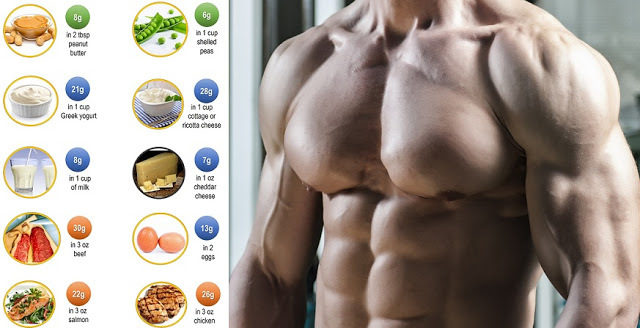 Home nutrition How Much Protein Do You Need To Increase Muscle Mass? How Much Protein Do You Need To Increase Muscle Mass? If you are looking to increase muscle mass you need to ensure you are consuming enough protein in your diet. Protein is the building block of the body. Eating the right amount of good quality protein will build muscle, aid muscle recovery after exercise and burn body fat. So how much protein do you need to increase muscle mass? And where can you get good quality protein? If you are training hard to increase muscle size. You should be consuming between 1g and 1.6g of protein per pound of bodyweight a day. So for someone weighing 154lbs that is between 154g and 246g of protein a day. It is recommended to spread this daily consumption between 5-6 meals a day. You will want to make sure that your protein intake comes from good quality sources. You will want complete proteins which contain all 9 essential amino acids. Meat – Beef, venison, lamb. High protein sources and high in fat. Venison is lower in fat and calories to beef and lamb and highly nutritious. Poultry – Chicken and turkey. Lean meats are great to avoid excess fat in your diet. Eggs – Poached, scrambled, raw. Eat the yolk as well. Egg yolks are misunderstood and provide high nutritional value. Fish – Salmon, tuna. Brilliant protein source and increases consumption of Omega 3 and fish oils. Protein shakes – Quick no nonsense protein snack. Great for immediately after exercise, and just before bed time. EAS 100% Whey – Aspartame free and tastes great. USN Pure Protein – Slow release proteins make it perfect to supplement your meals and to consume before bed time to feed your muscles while you sleep. Reflex One Stop – All in one complete muscle building solution. 37g of protein and 5g creatine. Contains probiotics and digestive enzymes. The example eating plan below allows for the consumption of protein regularly throughout the day. A workout shake is consumed within 20 minutes post workout is quickly get protein to the muscles.